Preheat oven to 175 C. Grease and line a brownie tin or small cake tin. This mixture doesn’t make a huge amount so keep the tins small or double the mixture for a bigger tin. Melt the butter in a saucepan over a medium heat. Once melted, remove to a larger bowl and allow to cool for 5 minutes. Add sugar, vanilla, cocoa powder, salt, food colouring and vinegar in that order, mixing between additions. Whisk the eggs in a small bowl, and add to cocoa mixture. Fold the flour in gently until combined.Pour 3/4 of the batter in to prepared tin and smooth out. Reserve the last quarter for top. For the cream cheese layer, beat cream cheese, sugar, egg and vanilla together. 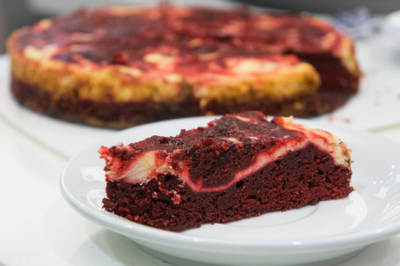 Gently spread the cream cheese layer over the top of the brownie layer in tin. 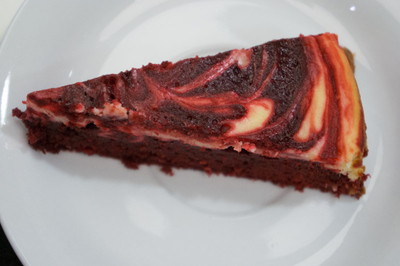 Dollop the remaining reserved brownie over the cream cheese layer and using a skewer, swirl it through the cream cheese creating the marbled effect. Bake for 40 minutes or until a skewer comes out clean (it may take longer depending on oven type). Allow to cool for 10 minutes before removing to wire rack to cool completely.